With it being MERE DAYS away from September (more like two weeks but WHATEVER), I’m craving anything and everything that reminds me of Autumn and what better way to do it than with tasty apples and pears! I bought my fruit from the farmer’s market but really, any mix of pears and apples will work well here. I made this fairly late at night so forgive the lighting. 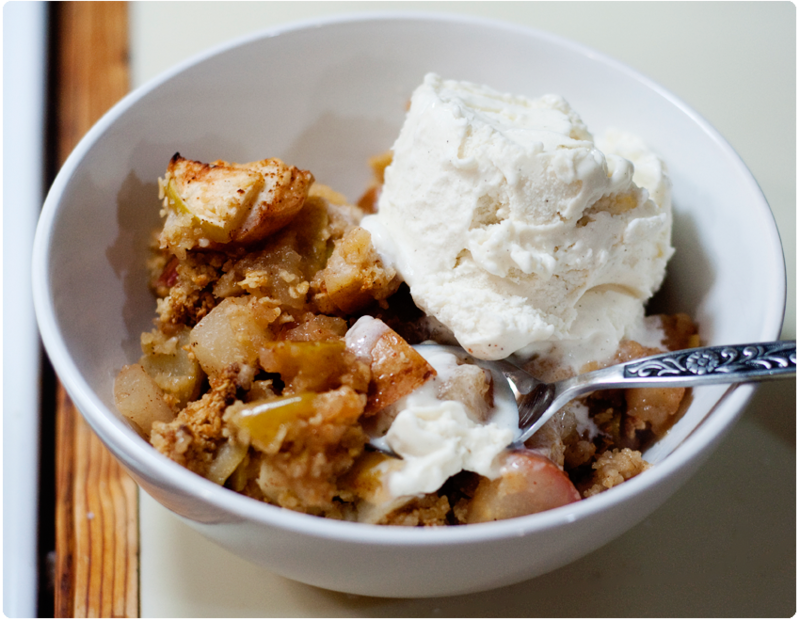 Toss all the apple ingredients in a bowl, stir well and let sit while you create the crisp topping. In the bowl of a food processor (or in a bowl with a fork), toss in all the Crisp Mixture ingredients and pulse until combined. Seriously. SO EASY. Just ponder doing this EVERY NIGHT! Because I do… because it’s SO EASY! 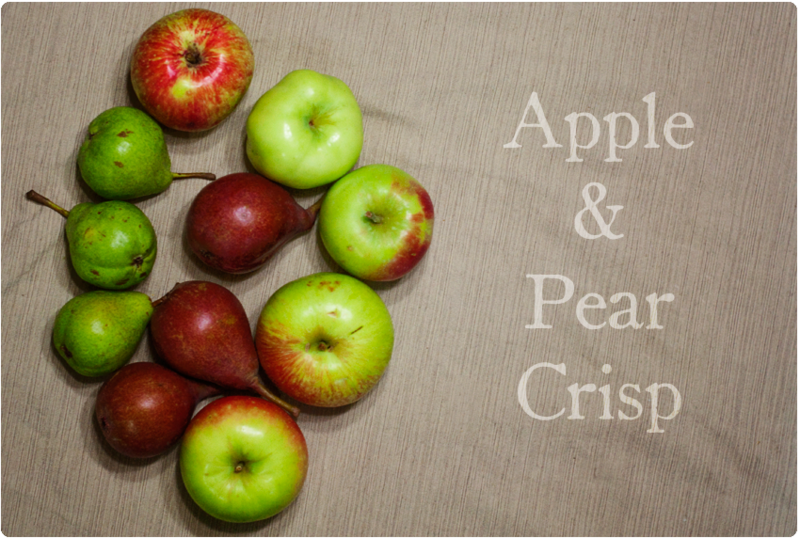 Pour the apples into your baking dish and spread the crisp mixture evenly over the top. Bake for 35 minutes until the top is golden brown and awesome. Let cool for 45 minutes otherwise it’s like molten lava. Top with vanilla ice cream and praise your awesomeness. This makes about 8 servings, each serving is 1/2 C. Only 207 calories too which is fabulous! I’ll probably make this again ASAP because I NEED more! 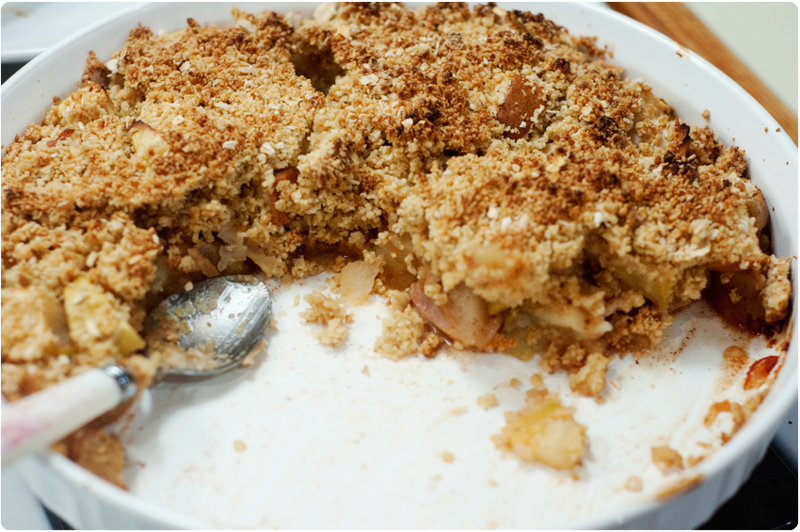 I bet this recipe is easily veganized AND the crisp topping goes for a wide variety of fruit crisps. I do it with peaches, strawberries, cherries, a mix of everything really! This makes me want autumn to be NOW. Looks delish! It was super yummy. I know I’ll be baking this every night once Autumn arrives lol. This looks amazing – and easy! Can’t wait to try it! This looks so good. Can you tell me what size baking dish you used? Thanks!